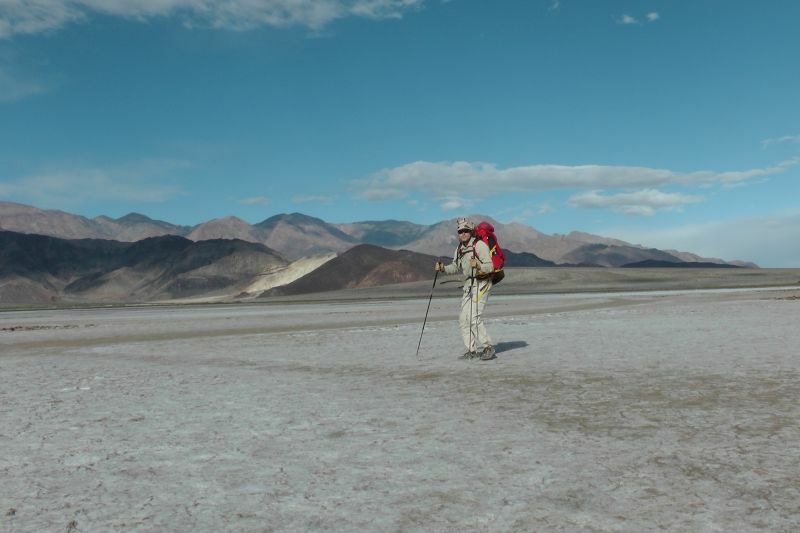 The description and objective of this expedition Death Valley Trek. Day 0 (29 Oct): Took the bus from Las Vegas to Beatty. There is then no transport to DV so I hitch hiked. It's illegal in Nevada but I had no other option... and I walked and walked in my F***** jeans and for 4 hours no one took me. At the border with California, finally... but no hourray as they dropped me at a turnoff still 19 miles from Furnace Creek. I has to walk another 2 hours before Chinese tourists took me. I'm now sunburnt :( Arrival in Death Valley Furnace Creek 4.20 pm so I got my CLIF BAR package. But arrived at 5.02pm at Farabees Jeep Rentals where they have perhaps an "expensive" solution to drop me at the start. I'll take expensive. I have to go. I repacked and tomorrow I hope to be dropped North with a 1,5 day delay. Grrrr as the moon is not full anymore. The good sign is that the 6 hours of walking on the sealed road -in jeans- were OK with a good wind and I only had 1 liter to survive. Bad thing is I have a small blister and face sunburnt. One day at a time, one day at a time. Tomorrow evening, (so Saturday morning in Europe) you should have the daily update written by Jeremy. I will call him every day at the end of my day on his mobile phone. 23.43... off to bed in my MSR Tent. The wind is very strong. The temperature is perfect. Jessie drops me at 1.30 pm. I film and leave at 2 pm. My aim is to pass the mountain and the deep canyon before darkness. What a pleasure to start walking in the desert. After the hurry of preparation and the difficulties to reach the starting point it is a really important to finally being immersed oneself in this great environment. I crossed the Last Chance Range with no major difficulties (except few falls due to the backpack weight). Then I started to walk through the canyons. As foreseen, after a short night I will start walking during the night thanks to the moon light. Due to the sun and heat, I had to stop during 3 hours in the middle of the day. My only protection was the mirror canvas of OutdoorLogic. Works like Charms. Whatever the expedition, the third day is always difficult. You start suffering of strain, both physical and psychological. Moreover I feel a little bit sick due to a wrong mix of salt and water in one of my water tank and exhausted by the heat. I just can't cool down even at evening when it's only 10C. What's wrong with my body, my heart is pumping super fast. I thought several time to abandon and will decide tomorrow. I'll take time to have rest and think about my options. I decide to abandon, the salty water makes me not sweat at all so I am overheating and could die from a heatstroke. Fortunately, each day is different from the previous one ! After walking few hours, I decide to walk over a small dune to have a different outlook of the valley and my exit point at Stovepipe Wells. It was the best idea I had for a long time. Indeed, I saw close from my position small 3 small puddles of fresh -dirty and greeny- water due to the last (and unusual) extremely rain of last week. I replaced 10 liters of my salty water with the green water, mixed it all and added enough micropurs. The process took a lot of time an then I had to wait -and rest- for the water to get purified and drinkable. Twice a day, I remove my shoes and add bandage to locations prone to blisters. I'm ready for a "new" start, the morale is on top. I have to turn back and join the shore of the "dry lake" near the mountain. Following the shore and its rocks during the evening darkness. Finally I reach a "good" field : almost flat and stable. Now I walk straight South with a good moral. The center of the lake is muddy at times but I only get max deep to my ankles at times. I have to learn reading the different colors of sands. White can mean hard or sink through it. Only cracked ground means dry and firm. 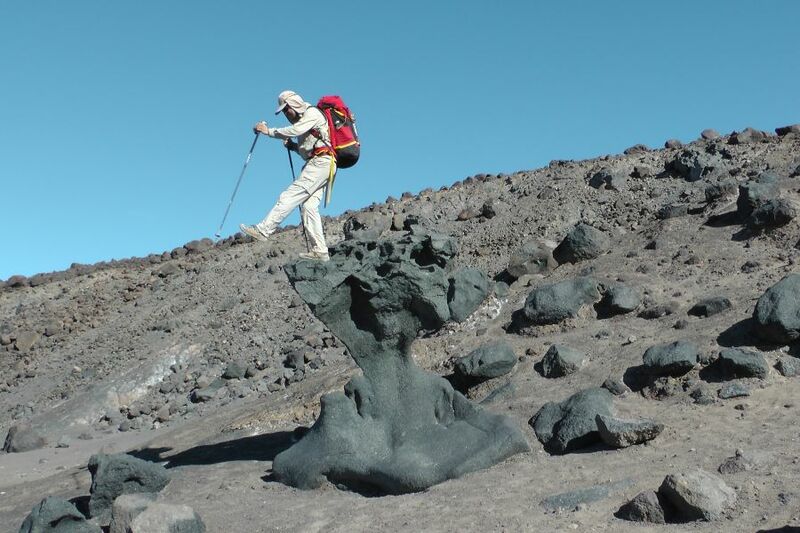 I heard a story of this man walking across it and he went through the crust deep until the head. He couldn't move and died. I see a few tracks of people having crossed the lake East-West but I'm the only crazy (idiot?) going full South across. Good progression today. I really experience what desert and desolation means... : sand, bushes, and salt... This desert has 20+ various terrains. I keep walking ! I'm close to the finish line ! The backpack is lighter than ever and it gives me wings. The field is definetly not a highway but it is better than yesterday. I take few risks by choosing to walk close to rocks field and small canyons during the dark with my tiny headlight but it paid. It was a gain of 4 or 5 miles of walking for the day. Next news at the finish line I hope. ARRIVED ! 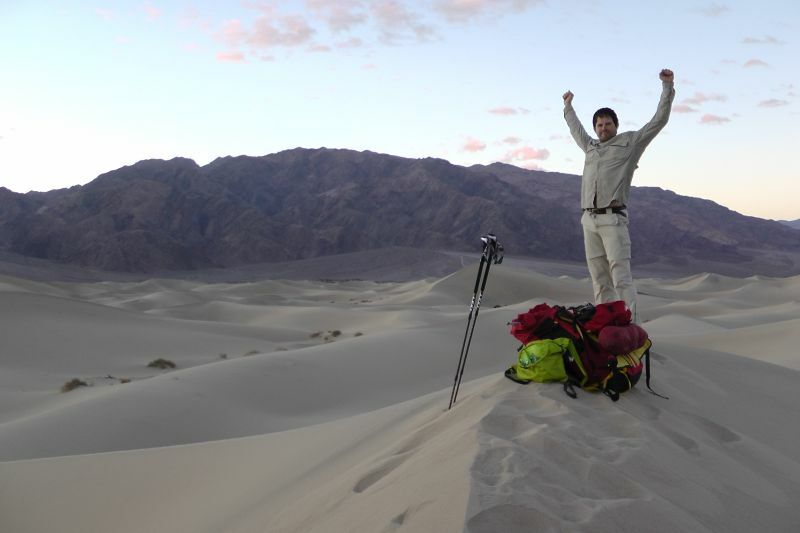 I succeeded in trekking the entire Death Valley unsupported. 9 calendar days but a Total time of 7 days - 23 hours - 40 minutes. Come on, 8 days. I am so happy to have made it. 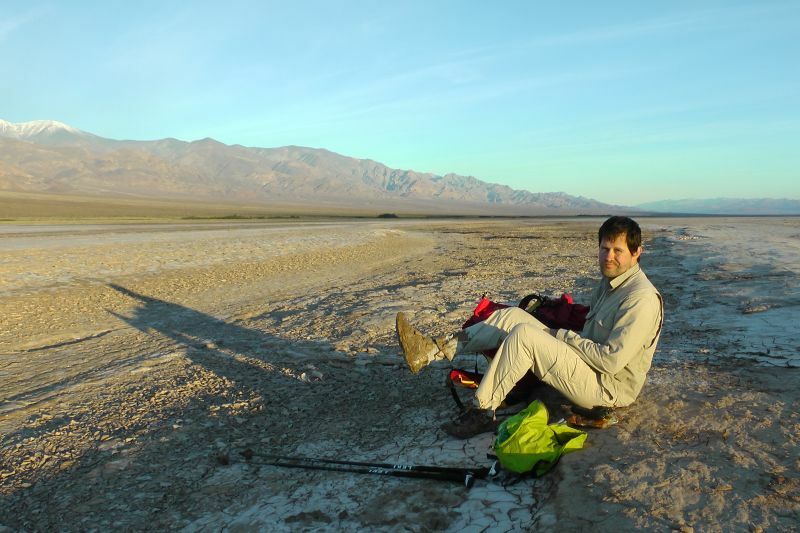 My last expedition was 2 years ago in 2013 and it was a failed one. That failed expedition will have a second attempt in September 2016. Today my feet are still in pain, I believe I have a small infection as my calf was swollen for the past days but it's better now. My right kneecap hurts, perhaps a small fracture but I wait a few more days before going to see a doctor. * go starting with a 85% coming new moon, so you have a full moon mostly all night long for all days. (I started with an 85% leaving full moon). * Less camera gear, no tripod etc... to save another 5kg or so. * Walk really 18-20 hours per day using the moon and headlight torch. I have an average of 16 hours per day with a 3 days where I didn't walk for about 2/3 hours. Even a return trip unsupported is possible I think in 11 days with day 6 being a run to the end with no pack for 2*30 miles or so. The last left big first in DV is to do my route during the summer June, July or August. It is possible but it needs a lot of back and forth moving loads of water. D1: 11,6km - D2: 24km - D3 : 31,6km - D4 : 25,4km - D5 : 29,5km - D6 : 38,5km - D7 : 35,4km - D8 : 31,3km - D9 : 21km = 248,3km. Advisors: Ray Zahab, Marshall Ulrich, Régis Belleville, The DV Rangers. Thomas de Dorlodot who let me use his Garmin GPS. Special thanks to Outback Logic to allow me to test their sunreflecting fabric. People who took me hitch hiking: Employees of StovePipe Wells, a Chinese tourist couple, Linda from Sweden, JJ Graham -while we were driving she lost the brakes of her car, we could be dead- and Mark and his wife from Indianapolis. Special Thanks to Jared for the sandbuggy ride. The people who took me hitch hiking: Linda, Mark & wife, Jessie, JJ Graham.